Crazy Golf and Giant Garden Games for hire. Hire a Crazy Golf and a variety of Giant Games and Garden Games. Our mobile Crazy Golf Course is available for hire for both indoor and outdoor events. Hire anything from a couple of Crazy Golf Holes to a complete nine hole course. Our Crazy Golf features spirals, deadends, loop the loop, bridges, turrets, humps, bumps, and much more to challenge your putting skills. The putting surface is high quality artifical grass. Our mobile Crazy Golf is ideal for fetes, fundays, and corporate events and can be supplied with an attendant if required. Crazy Golf is suitable for all ages and is supplied with both left and right handed putters in both adult and child sizes so everyone can take part. 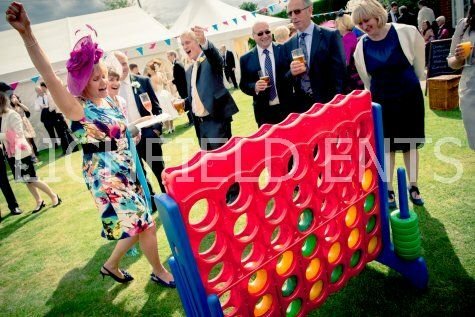 We have a range of giant games for hire including giant jenga, giant connect 4, giant noughts and crosses, giant twister, and giant snakes and ladders. All provide great entertainment for all ages at garden parties, wedding receptions, or indoors for after dinner events.